Baal HaSulam, “The Arvut (Mutual Guarantee)”: If a part of the nation does not want to keep the Arvut, but rather chooses to wallow in self-love, they cause the rest of the nation to remain immersed in their filth and lowliness without ever finding a way out of their filth. Besides, the whole world is divided into “Israel” and the “nations of the world,” and it plays an important role in our generation. If we the “people of Israel” are not adapted to the laws of mutual guarantee, we convey to the “nations of the world” that it is okay to remain in the ego and empower them to do so. On the other hand, by our true work in mutual guarantee and connection, we reveal the Light in Israel and by that help the nations of the world correct themselves. “Israel” are called GE (Galgalta ve Eynaim). And the “nations of the world” are called AHP that is under the first restriction (Tzimtzum Aleph). 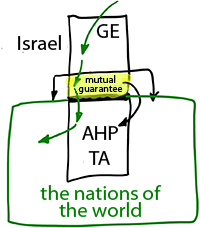 We work on mutual guarantee, not in AHP since it is impossible to do so, but only in GE. However, if to some extent we allow the presence of corruptions that belong to the corrupt desires, if we are lazy, or if we neglect the correction of certain parts, we strengthen the vessels of AHP accordingly. In the meantime, we are also in contact with the nations of the world, and accordingly the Light influences GE and flows to AHP and to the nations of the world who feel their power. Thus, our internal division affects what goes on in the world and when nations accuse Israel of anything, they are basically right. If we had corrected ourselves, then there wouldn’t have been any negativity in the world. It all depends on the correction of Israel, and this is where all the global consequences stem from, both the good and the bad.